These natural Loofahs whisk away dead skin cells, leaving skin soft and smooth. The outermost layer of your skin, the epidermis, naturally sheds dead skin cells. Normal friction removes some of these shed cells, but others remain in place, dulling your complexion or turning it ashy. Exfoliation helps this natural process along, using gentle friction to brush excess skin cells from the surface of your skin. Removing dead skin cells not only improves the look of your skin, it also sweeps away places where bacteria and soil could collect. Any friction on your skin also increases localized blood flow. Capillaries, the tiny blood vessels closest to your skin, naturally expand when stimulated. You've made use of this response if you've tried to warm your hands by rubbing them together to create friction and stimulate blood flow. A loofah has a similar effect, stimulating increased circulation to areas that you scrub with it. 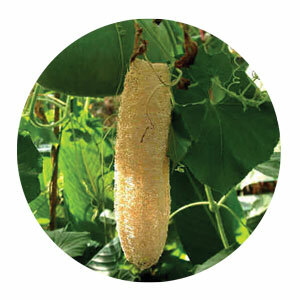 A loofah (also spelled luffa) is a fruit grown from a tropical vine. Loofah fruits, or gourds, are edible when fresh. To make a loofah scrubber, the gourd is dried and peeled, and the seeds are shaken out.